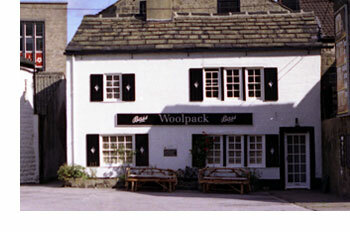 The Woolpack was built as a dwellinghouse in the 18th century and converted into an Inn at a later date. In 1827 it was originally called the “Kings Arms” but became known as ‘The Woolpack’ around 1860 as the 1861 Census shows Frederick Freeman as Inn Keeper of The Woolpack. William Shires was Inn Keeper on the 1871 Census and remained so until circa 1888. Thomas Richardson came next and in 1890 the Licence was transferred to his wife Sophia Richardson. Many more landlords followed, including David Ripley, Joseph Staton, Joseph Ramsden, John Edgar Bradley, James Waterhouse and in 1912 Albert Franklin to name but a few. George Bean was landlord in 1922, followed by Robert Bean. More recent tenants have included Brian and Sheelah Long from c1968 to 1980, Jean Lambe in 1980 who went on to marry Peter Knights who both ran the Pub together until at least 1997 and Chris Roberts 2003. It closed as a pub for the last time around March 2009. In 2003, the then landlord said there had been strange happenings in the pub which gave him the creeps. There were unexplained smells and darting figures. A regular customer called in one day and whilst talking to the Landlord saw a little pair of legs with those old-fashioned lace-up shoes standing behind the Landlord in the background. She said the image faded away when she looked up at the body. This was only one occasion out of several which had occurred. Fears grew in 2009 when the Grade II listed building was put up for sale by the owners, Enterprise Inns, and could be possibly be lost as a pub like so many others in the town. The asking price was £200,000 and offers had to be in by 9th July with a view to completing an early sale. By September, the agents had received a number of offers but still had to process them and the freehold of the building was, therefore, still available, and it was still the same situation in October as they hadn’t received any acceptable bids. The following year, in April 2010, it was announced that the former pub was, subject to receiving planning permission, to be converted into a state-of-the-art music and arts centre by The Big Hoo-Ha Company, a non-profit making community arts and music group. The planning application was for the change of use and alterations of public house to an art studio and arts education centre with a two bedroom flat. Due to it being a listed building, the proposed new purchaser was limited to what could be altered. The go-ahead was given in June 2010 when Leeds planners approved the scheme and it was hoped that contracts would be exchanged between both parties in readiness for moving in by 2011. Contracts were exchanged, followed by completion of the sale, and work started on stripping out the building in October 2010. The building works were finished in July 2011 and the former pub re-opened as the Woolpack Music and Arts Centre in August 2011.